Engineering students will present their capstone projects on April 30 in the Tate Student Center’s Grand Hall. Seniors design solutions for groups around the state, nation. From a virtual reality system allowing pediatricians at Children’s Healthcare of Atlanta to practice delicate medical procedures to the construction of a new pedestrian bridge for the Wormsloe Historic Site near Savannah, students in the University of Georgia’s College of Engineering are using their senior design projects to give back to the state. The yearlong projects are part of a capstone course that tests seniors on all the engineering concepts and skills they’ve learned and practiced during their undergraduate studies. They will present their projects on April 30 in the Tate Student Center’s Grand Hall. The event is open to the public from 3:30 p.m. to 4:30 p.m. The College of Engineering’s approach to its two-semester capstone senior design course differs from many other engineering programs, where students are assigned theoretical projects and present their findings only to a supervising professor. UGA engineering students work closely with clients across the state and the nation. Many of these connections are facilitated by the Archway Partnership, a public service and outreach unit. Delloyd’s team worked with Gulfstream Aerospace of Savannah to develop an eye tracking system for a virtual reality flight simulator. Gulfstream is interested in exploring the technology to not only determine a person’s flight readiness but also to optimize indicator and control locations within the cockpit of their jets. 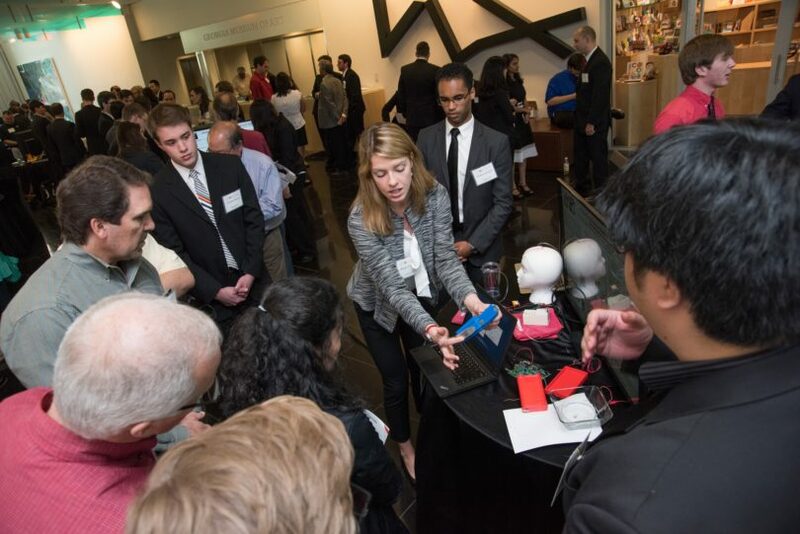 A total of 77 teams involving more than 300 students produced capstone projects for a number of companies this year, a record for UGA’s engineering college, which has experienced extraordinary growth since its founding in 2012. Another group of students developed a continuous blood glucose monitoring system designed exclusively for cats and dogs, a project they worked on in partnership with a veterinarian. “Right now, the vet has a device intended for monitoring blood glucose in humans, but the glucose levels in cats and dogs can be significantly higher than those for humans, and the device cuts off data before real levels are shown,” said Chery Gomillion, an assistant professor of engineering at UGA. Because there are no companies that make glucose monitors for pets, the students designed a computer program that converts readings from human monitors to a data set that displays glucose levels relevant to animals. Students working with Caterpillar are designing a new tracking system that will follow parts as they move throughout the company’s massive manufacturing facility. Another team is helping the company develop new methods of detecting damaged or missing O-rings in heavy equipment.